Abstract of INFO-MAC archived encoded Mac binary file "daily-tarot-20.hqx"
This is a new version of the popular Daily Tarot 1.1, released back in 1995. It is full of new features, including all new artwork for the Tarot deck, fully modeless dialogs, a new card viewer with find and interpretation capabilities, saving and printing of the daily forecasts, personalization and the ability for the user to set the forecast date. This is a graphically intense program as it contains a fully rendered original amd unique Tarot deck in full color. Daily Tarot 2.0 lets you get a daily tarot reading for the major areas in your life, love, money and work, use it before you go out in the morning or before you go to bed at night. 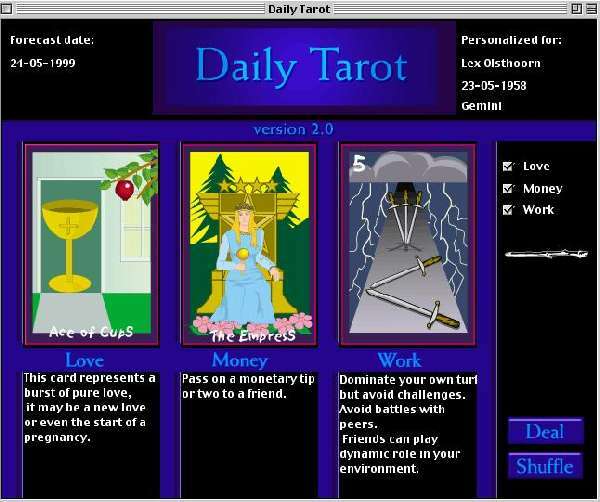 Daily Tarot is Power PC native and thus requires a Power mac to run.